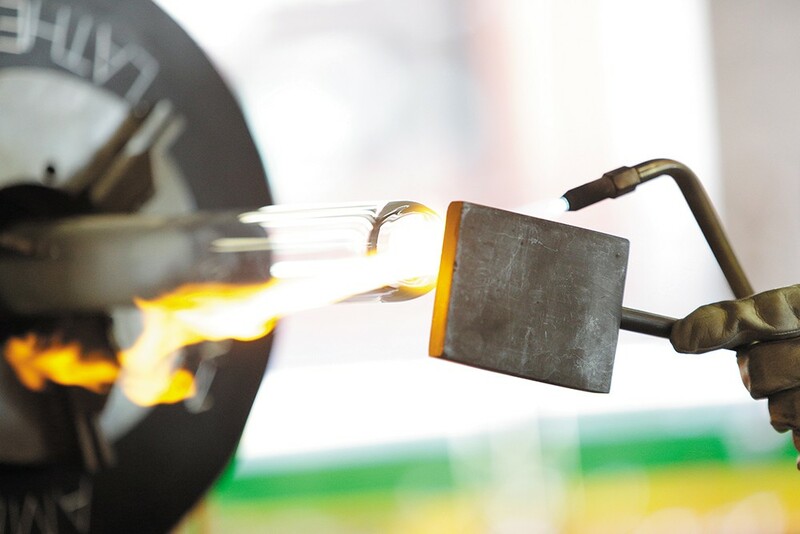 A thick gout of blue-white fire jets out of a blowtorch, licking around the glass tube. As the tube spins around and around in the lathe, it glows orange with molten heat. At these incredible temperatures, glass turns from a solid you can shatter into something closer to taffy. You can sculpt it and refine it down to thinner than a millimeter, making it far easier to work with. 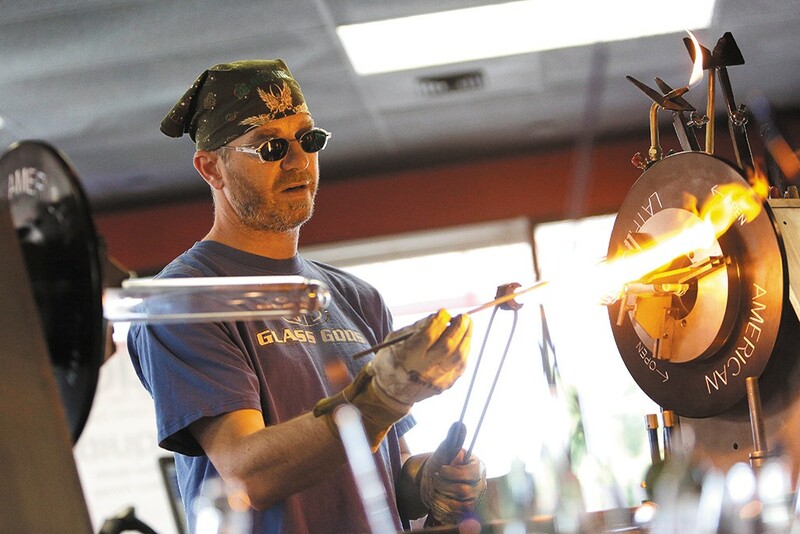 Tim Bohr, owner of Glass Gods in Spokane Valley, cranks a handle on the lathe and the sides pull apart, the glass tube slowly stretching into two separate halves. He taps a pedal with his foot to send out an extra burst of heat. He holds a rubber hose in his mouth and breathes a puff of air, pushing the bubble out in the glass. It's a long way to go for a water pipe, but the process itself has its own sort of elegance and beauty. As a self-described "pyromaniac," Bohr obviously loves the fire. He also truly loves glass as a substance. "Nothing else in the world's like it. Nothing else can you get 2,500 degrees and it looks so pretty when you're done... Glass takes the abuse. It's so pretty, it's clean," Bohr says. "I like the way the glass reflects light. So when I look at a piece, when I look at quality, I look at how it reflects. See the reflection? See how it's pretty, like a pool ball?" 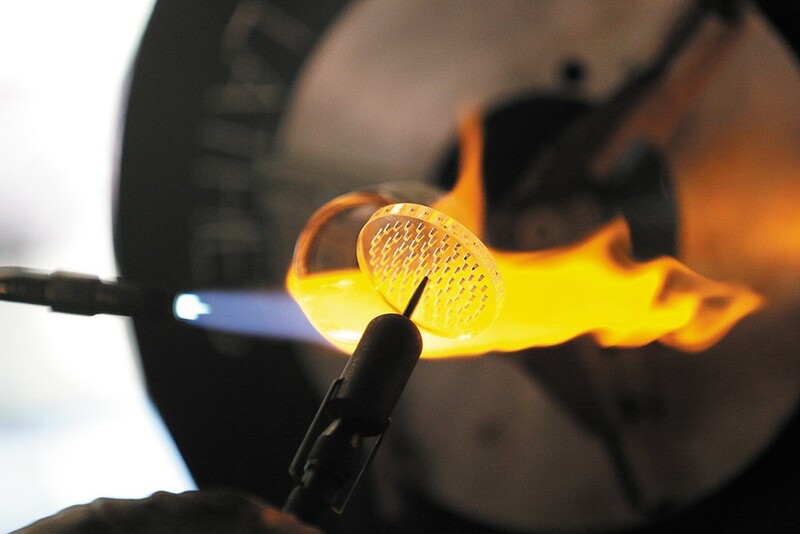 He takes a graphite carbon rod and swabs it around an excess piece of molten glass, removing it from the project. 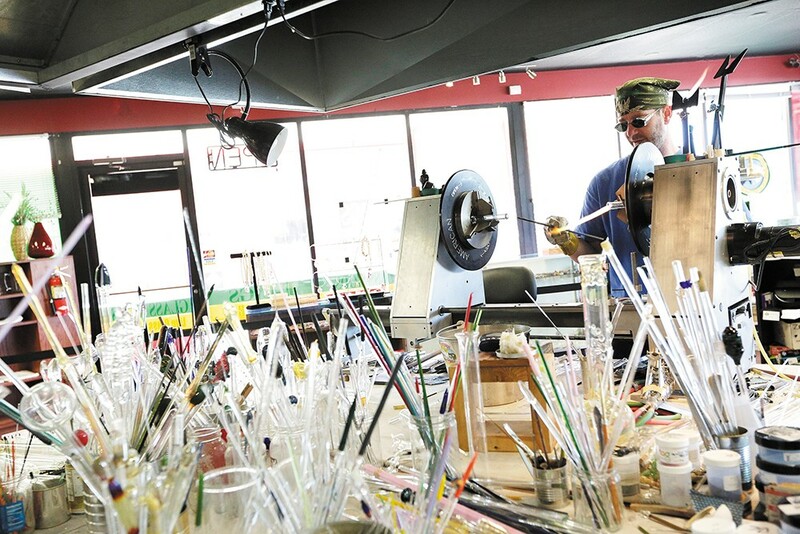 Bohr has made Christmas ornaments, fuel sight gauges for airplanes, even the delicate glass flower sculptures sitting on the display case in his shop — but the vast majority of the glasswork on display in this shop, unsurprisingly, are the water pipes. Some of Tim Bohr's handiwork. The walls at Glass Gods still have the "ALL PRODUCTS ARE FOR TOBACCO USE ONLY" signs that were common in shops like these before weed was legal in Washington. Legalization of marijuana, if anything, has brought out the imitators. "More competition," Bohr says. "Moneywise, it's no different. You have to work harder at it." If anything, Bohr has been frustrated by the recent flood of cheap water pipes from China. But he still has a niche: He takes requests. Hanging above his kiln are several crude sketches of pipe designs provided to him by his clients, and he'll seek to turn those drawings into glass. He doesn't like the label of "artist." He sees himself as more of an engineer, practicing a craft honed by decades of experience. He sees it as no different than building a model airplane, step by step. Bohr has been working at this job since 1997. It took him five years — much of it spent making simple glass beads — to really get the hang of the process. It takes hand-eye coordination. It takes an eye that can spot the smallest flaws. Strength in glass comes from perfection. A bad weld can lead to shattered glass. A good water pipe should be strong, pretty and smooth. "If a water pipe ain't smooth, what the hell you got it for?" he asks. How long does it take to make one of the pipes?